Belly Burdens: What is Fructose? Fructose is one of the two main naturally occurring sugars, the second being glucose. Glucose and fructose are both monosaccharides, meaning “one sugar”, as they only contain only one form of sugar molecule; as opposed to sucrose (also known as table sugar), which contains both fructose and glucose, and is therefore a disaccharide. Lactose is also a disaccharide, as it is made up of glucose and galactose. The body’s reaction to fructose, especially in those with fructose malabsorption, depends on the form that fructose takes in our foods. Fructose comes in two main forms: fructose, which is the single molecule, and fructans, which are chains of fructose molecules. Fructans are the more difficult form to digest, even for those who are not sensitive to fructose. Fructans are most commonly found in wheat, which is why those with fructose malabsorption often find that bread is a very problematic food. For this reason, up until my diagnosis with fructose malabsorption, I believed for quite some time that I may have had Coeliac Disease. As I mentioned above, fructose and glucose are both monosaccharides, however they are absorbed very differently in the body. The main reason that fructose can be problematic for many people is that is it not easily absorbed in the body – in fact, only liver cells can break down fructose. In contrast, the majority of the body’s cells can easily break down glucose and convert it into energy. Fructose and glucose are often found together in foods, and because it is easier to digest, glucose can actually help the body to better absorb fructose. Foods that contain a higher proportion of glucose than fructose can also be easier to digest. My dietician suggested that one way to help reduce the symptoms of fructose malabsorption, particularly if you are in a situation where it is difficult to avoid foods with high fructose content, is to take a glucose tablet with your meal. Food Intolerance Diagnostics has created a quite useful table showing the fructose/glucose ratios in many common foods here. Disclaimer: As I am living in Australia, the below table is accurate for foods produced in Australia, but may not be consistent for foods in other countries. For example, the use of high fructose corn syrup (HFCS) in soft drinks and sweets is much more prevalent in the US than in Australia, as it is commonly used as a substitute for sucrose. For readers based in countries other than Australia, please only use my table as a guide. 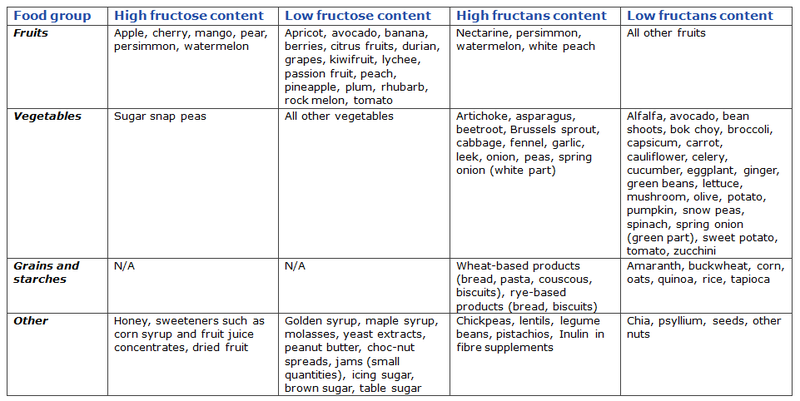 For your information, I have created the below table outlining the fructose and fructans content in common foods, which is based on information provided by Dr. Sue Shepherd, in her book Food Intolerance Management Plan. Rather than always avoiding your favourite foods, look for ways that you can substitute different ingredients so that you can reduce the symptoms. Here is a very good website for information on ingredient substitution. Each person will be affected by different foods in different ways, and it is almost impossible to completely avoid fructose in your food. Over time, try to work out what your thresholds are for eating different foods, by slowly trying different amounts of the foods and concentrating on your body’s reaction. My dietician gave me some very good advice: for those foods classified as having low fructose or fructans content, use “handfuls” as a measure of your portion sizes for each food, as it can still be very easy to exceed your body’s tolerance threshold. For those who also have IBD or other problems, be very aware of the different ways that your body reacts to different foods and at different times, has there could be different reasons for your symptoms. More details on this here. Cooking for yourself is often a much better way to avoid problem foods compared to eating out or getting take away meals, as that way you have much more control over which ingredients are used. Belly Burdens is now on social media! Why am I so uncomfortable?